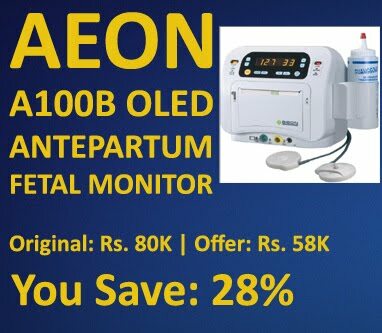 A100B is a fetal monitor with OLED display, which is designed for clinic and small hospital. It can act as a fetal monitor in channel 1 and fetal Doppler as channel 2. 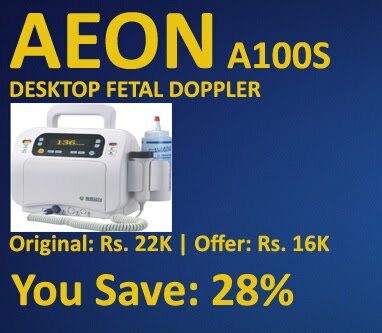 It is lightweight and space-saving fetal monitor which can be operated at bedside and acted as handset. It is designed to use in the antepartum and intrapartum applications. · OLED Display indicates FHR / Toco as numeral, trend diagram and outputs fetal heart sound. · 6 Working Modes: FHR & Toco Mode, Curve Mode, Replay Mode, Average FHR Mode, Countdown Mode and Manual Count Mode. · Recording information like FHR, Toco and Fetal Movement. · Patented Acoustic design enhanced vivid sound. · High Sensitive 7/10 Elements 2 MHz Pulse Doppler Transducer. · Auto/Manual Fetal Movement Measurement. · RTC Timer inside can display day/hour/minute. · Built in Thermal printer with adjusted printing speed. · 12 Hrs patient CTG data storage and reload ability. · Event marker make 8 kind events. · Built in re-chargeable battery for 5 hrs. Continuous monitoring. · Medical-use switch power supply guarantee 50,000 hrs. working life. · RJ 45/USB connection interface option. · OLED Display indicates FHR as numeral, trend diagram and outputs fetal heart sound. · High Sensitive 2.5 MHz Pulse Doppler Transducer. · 36 Hrs patient data storage and reload ability. · Built in re-chargeable battery for 12 hrs. Continuous monitoring. · Alarm is enables when FHR runs beyond set limits.